In the early 1990's Street Fighter and Mortal Kombat dominated the fighting game genre, inspiring many developers to try and replicate the successful formula. Sega's attempt was Eternal Champions, which feels like they were aiming for a happy medium by incorporating the best of both franchises, but was it any good? Let's find out in this review... It's clear from the start that this game was not a quick or lazy attempt. Unlike many fighters from around that time, this one has a fairly decent story, with each character having a meaningful backstory and purpose. The basic premise is that the Eternal Champion needs to restore the balance of good and evil, taking nine individuals from various periods in time who were killed before they could have a positive impact on the world. Only one can be resurrected with the knowledge of their fate and how to prevent it, so they must all participate in this tournament for a chance to come out victorious and fulfil their destiny. This was an excellent idea as it allowed for a diverse range of characters and provided a foundation of unlimited possibilities for new ones in future sequels. My personal favourites were Larcen Tyler and Midnight. If you take the time to read through each biography, you're likely to want each one of them to succeed, which is a shame as there can only be one. The graphics are really impressive. While some may find the art style to look a little "grainy", this was a method used to add more depth, light and shade to overcome the Mega Drive's graphical limitations. Everything has a nice level of detail with large sprites and plenty of frames of animation to give it a fluid look and feel. In terms of sound the intro music is fantastic. It's a theme which has stayed with me for years and has aged fairly well. Definitely something I'd like to learn on guitar one day. Sound effects are solid enough and the music is a bit mixed on certain stages, but overall very good. So what about the gameplay? Well, first off, this game is hard as nails! In all my years of owning this, I've never had the skill (or patience) to complete it. I had a quick try while working on this review and no, I still couldn't finish it. I have completed the original Mortal Kombat trilogy of games, Killer Instinct and Street Fighter 2, so I like to think I'm not too bad at fighting games for a frame of reference. For controls, Eternal Champions utilises the six-button pad in the same way as Street Fighter, with light, medium and heavy attacks, holding back to block. One unique mechanic in this game is inner strength, presented as a Yin Yang at the top of the screen next to each player's health metre, which limits the amount of special moves you can perform so you can't just spam your opponent with them. This can be difficult to keep track of in the heat of battle, but fortunately can be turned off in two player mode if you're not a fan of it. If you've only got the traditional three-button pads, you're going to have a hard time as you'll need to use the start button to toggle between kicks and punches for your A, B and C buttons which is far from ideal. Do yourself a favour and invest in two six-button pads if you haven't already. Multiplayer mode is where I'd advise you to spend most of your time. There's the aforementioned two player mode where you can toggle various settings, including the option to enable replays which I was impressed by. You can also fight in the battle room, allowing you to select from various hazards which is quite fun (This is also available in the single player mode) and you can even setup a 32 player tournament if you're having a party, gaming event, or you're slightly insane. You may be wondering where Eternal Champions takes it's inspiration from Mortal Kombat, seeing as so far it looks and feels more like Street Fighter with it's slightly cartoony art style, button layout and fighting mechanics. Well, this game has stage fatalities, which is calls Overkills. For some reason this non-gory game takes a bit of a dark turn if you happen to be standing in just the right place as you take that final blow. It's a pretty rare occurrence in the natural flow of combat and I'm not really sure why they felt the need to add them, other than to be a pretty cool and unexpected surprise. It's a bit gimmicky, some people may argue they're a little out of place, but as someone who grew up on the Mortal Kombat series as a kid, this was a fun addition for me. Eternal Champions is an easy recommendation for the Sega Genesis and Mega Drive, despite it's difficult and cheap AI in single player mode and it's inner strength mechanic. There's a lot more fun to be had with friends, thanks to the ability to toggle settings, view stats and setup tournaments. It's a real shame Sega chose to ditch this series completely for the sake of Virtua Fighter. A good game, but I'd have loved to see how far they could have taken this series. For those interested, a sequel was released for the Mega CD which made numerous improvements and there was even a few spin-offs which weren't so great. My friend Kim Justice did an excellent mini documentary which goes into more detail, which you can view here. If you enjoyed this game, beat the Eternal Champion or played a full 32 player tournament, let me know in the comments below! "To mark the 20th Anniversary of GoldenEye, we are delighted to welcome five of that original group to talk about the creation of this seminal shooter. The Q&A, hosted by Paul Drury and Martyn Carroll of Retro Gamer magazine, will end with an opportunity for audience members to take on the makers of the game in a multiplayer deathmatch, with prizes". "We're very excited to be able to announce that we will have a panel talk and Q&A with a number of former Psygnosis team members at PLAY Expo Manchester this October. Psygnosis was formed in 1985, was acquired by Sony Electronic Publishing in 1993 and became SCE Studio Liverpool. The studio closed in 2010 but during their lifetime Psygnosis created and published many iconic games - from 16-bit classics such as Lemmings and Shadow of the Beast through to the massive Wipeout franchise on the PS1 along with G-Police and Colony Wars. A number of former employees will be joining us for the panel - confirmed so far are Mike Clarke, Martin Linklater, Chris Graham and Mike Kaiser with more to be added". "We know one of the biggest draws for attendees to PLAY Expo Manchester is the retro zone so this year we are going to make it even bigger! Last year we ran close to 400 machines across the retro zones - this year we're going for 500 making it the biggest ever collection of retro machines at any UK gaming expo! As well as more retro consoles and computers we'll be bringing back the handhelds section and expanding the classic PC games zone that we introduced last year. Our retro zone is a time slice of the past 40 years of games which will be featuring a number of consoles and computers, each running a selection of the best games for each system. So whether you're Sinclair, Commodore, Nintendo, Sega, Sony or even an Xbox fan, there will be something for everyone. 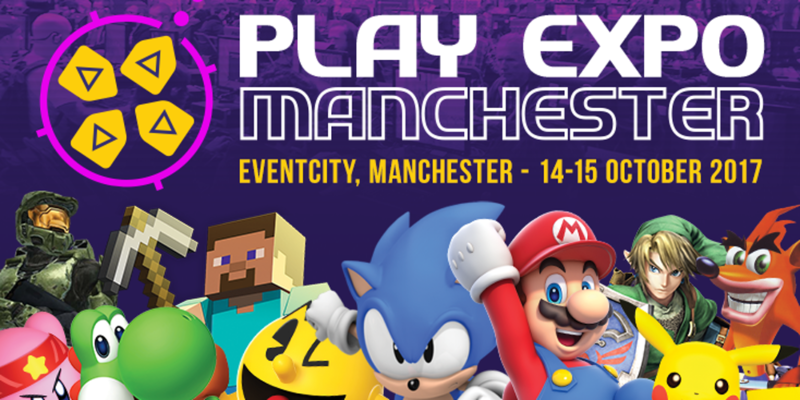 And of course we'll have a selection of games for each system too, so if you can't choose Manic Miner over Decathlon or Gran Turismo over Metal Gear Solid, don't worry as our event staff will be on hand to help you find your favourite game at PLAY Expo Manchester". I met loads of great people I talk to on YouTube and Twitter there last year and I hope to do the same this year. I'll post on twitter for more information on the event date and leading up to it.